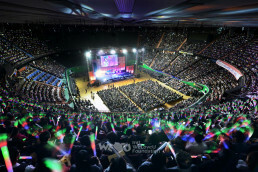 The early summer in Incheon city was beautiful when the white T-shirts of the foundation members filled the green forest. On June 12 (unday), 2005, about 15,000 “pure hearts” in white shirts gathered in the shade of trees at the Incheon Grand Park located in Jangsu-dong, Namdong-gu, Incheon. The “Incheon New Life Family Walkathon” was held by the New Life Welfare Foundation to help children suffering from heart disease and parentless households. The New Life Family Walkathon had been held once or twice every year since 2002 to give hope, love and encouragement to children suffering from heart disease and intractable diseases, parentless households and single parent households by supporting them with medical expenses and living expenses. 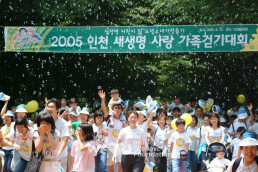 The walkathon was held four times at Namsan in Seoul; one time in Gwangju and Daegu respectively. In Incheon, this was the first time. The members living in Incheon had expected to have this meaningful walkathon at their city. Hosting this walkathon, they prepared various events and programs to make it full of love and happiness. 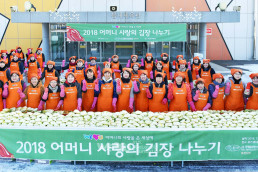 The walkathon was supported by Incheon Metropolitan Government, Incheon Times, Gyeongin Ilbo, Incheon Medical Association and WMC, and was sponsored by various organizations and persons who had the good will to help neighbors. 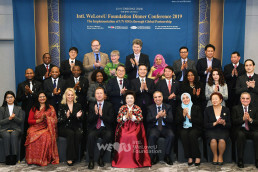 Many guests were invited including Jang Bu-yeon the Chief of Woman’s Welfare and Health Council at Incheon City who came in substitute for the Incheon City Mayor. After the congratulatory messages, 19 parentless households and children with heart disease and rare diseases received donations which were collected by the members’ love. The Chairwoman of the foundation delivered donation with a message of encouragement to each of the children and juveniles who were suffering from disease and poverty including Park Sang-bong (19) who lost his younger brother last year for the same heart disease as his. The members applauded, wishing them complete recovery and happiness. As the walking began, the members filled the whole 1.5 kilometer course from the outdoor theater to the sculpture garden, rounding the lakeside. Various events were prepared on the way: “Smile Brings Blessing,” “Limbo Limbo With Your Family,” “Like an Elephant,” “Let’s Deliver Love,” and “Walk Through Bubbles.” Each event contained the member’s hope to deliver smile to neighbors, society and the whole world. A cool breeze refreshed the members. A member, Park Gwi-bun (32, Guwol-dong, Incheon) said, “My family used to visit this park, but today is special because we can help somebody in need.” She added that her husband favored this walkathon more. Kwon Yong-o the Chairman of Incheon Medical Association said, “Walking is the best exercise, and when you walk with your loving family, its effect is doubled,” and emphasized that more walkathons should be held even for citizens’ physical and mental health. The citizens in Incheon, who came to the park for a holiday, showed their interest in the walkathon and cheered the members. They were all smiles, seeing the long walkathon procession, and said, “I’ve never known that these many people are doing good deeds.” Some citizens joined the walkathon, walking along the members who were walking on the bicycle path; and some asked the contact number of the foundation to donate. Surely love shared is love doubled.